You may get sick of hearing how much I LOVE every single polish I post about, but that's kinda how my blog works. See, I follow a LOT of nail blogs (you can see them all in the sidebar under "Blogs I Love") and I keep on the lookout whenever I hear about a new collection or polish coming out. I read and research reviews and swatches - A LOT - before I buy my polishes (yes, I buy my own - they are not PR samples). So usually what ends up in my nail polish collection are only those that I really deem worthy, and those are the ones I wear and post on my blog. I have hundreds of polishes and I truly "like" almost all of them and "love" more than half of them. Sometimes I'll end up putting on a "bum" one, but then usually I don't even feel like taking pictures of it. So there you have it. That's why I gush over almost all of the polishes I post about. Not because I feel an obligation to a company or to advertise for anyone. I write what I honestly think of each and every thing that I post on here. I have received a couple of PR samples, and those too are reviewed honestly in my own words of my own opinion (but that's not what my blog is really about - it's more about just sharing all these pretty things that I really enjoy). So without further ado, ANOTHER awesome polish! 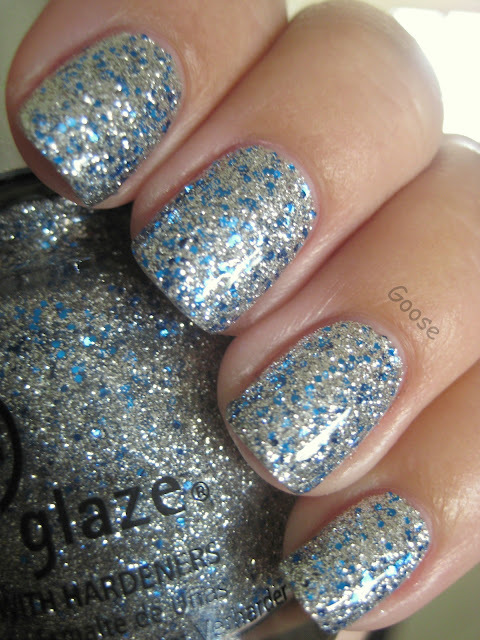 This is Lorelei's Tiara from the new China Glaze Eye Candy collection, and it's sooooooper sparkly! This is how is looks in normal indirect daylight. Very shiny! And then in the sun the sparkle is blinding! 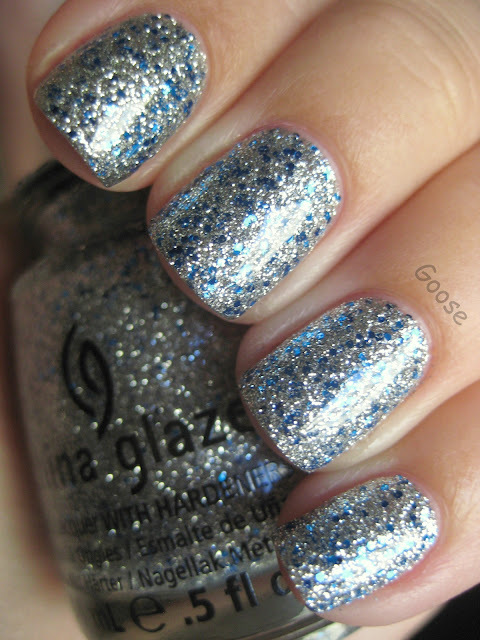 Probably one of the most sparkly polishes in my collection, and such a gorgeous icy blue effect. It was hard to capture the intensity in a still photograph - you HAVE to see it in person to appreciate it! In the shade, the blue glitter comes out a little more, but it still maintains an almost mirror-like effect. I feel like my fingernails should be icy cold to the touch with this on them. I like that this is wintry more than Christmasy, so that I can wear it into the new year as well. I found this at my local Ulta, which has had the Eye Candy collection for a few weeks now. That is absolutely gorgeous! I hear you on the whole "I love everything I blog about" thing, I only buy polishes I really love, so why would I blog about stuff that I don't enjoy? Totally understand! this is amazing! I need it pronto! I really like it on you! I only buy what I love and want to wear!! Otherwise it really is a waste of money!! Your nails are always so pretty! This is gorgeous! It's in my cart on of my polish-buying websites. So pretty!